The Flock comes with an interesting hook in that it'll go offline and become unavailable for sale once the population counter ticks down to zero. The game itself is something similar to "juggernaut" game modes from other online games, but with an emphasis on stealth. When you spawn into a match, each player tries to find and attain the light. Once attained that player will become the "Carrier" and every one else will remain as a "Flock". It features an asymmetrical cat and mouse style of gameplay where it's every one on the Carrier. You can gain points through killing flocks by shining the light on advancing Flocks, completing objective points, or simply through holding the light as long as possible. The Flock have a variety of ways to ambush the carrier. They can stand still which will put them into a "Petrified" mode giving full immunity to the light, they can also create decoys that they can teleport to at their will, and can give a howl that'll buff other Flocks around them. The core of this is pretty fun and interesting when you first jump into the game, though with this as the only game mode it can become repetitive after a while. The Flock is also pretty easy on the senses. The environmental and character designs are suiting to the mood and atmosphere, with ancient looking dilapidated environments, and eerie music and sound effects. The Flock does a good job at communicating it's dark themes. 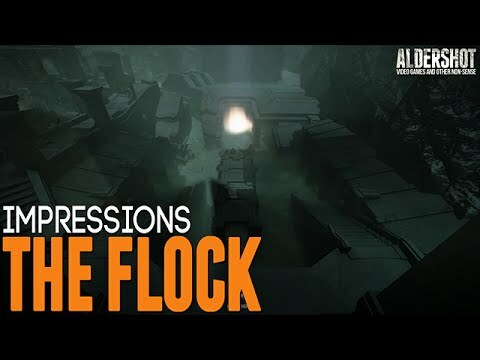 Though the hook of a permanent end to the game, and the core gameplay being initially enjoyable and interesting, the fun of "The Flock" doesn't last long. There are only 3 maps available and only 1 game mode. The game becomes very repetitive very quickly. There's also no incentive to continue playing with a huge disconnect from the mechanics and the perma-end concept. None of the mechanics would be affects if the perma-end system wasn't in place, and because of this, the immediacy that the game tried to force on the player falls flat. I feel like most players would be bored of the game before the countdown become relevant. You can experience every thing there is to experience in a matter of a couple of matches. Since that's the case, what's the incentive for players to protect the global population? Why should players care if it'll end permanently if the game can't hold their interest to see it to the end? There's not even a record system to track how much a player have contributed to the population countdown, making the game's premise feel pointless. Besides the design flaws with it's perma-end system, and the lack of variety, the Flock also suffers from a myriad of technical issues. The game sometimes crash from alt-tabbing or when a match ends and sends the player back to the lobby. The graphics setting's effectiveness is questionable and while playing with those settings, my game refuses to go fullscreen, It's stuck on windowed mode. I've also experienced lobbies that refuse to start the game, and games where the goal (the light) refused to spawn in. To say the least, The Flock has a lot of problems. Overall The Flock has an interesting foundation, but it's under developed, under conceptualized, and suffers from both technical and design flaws.